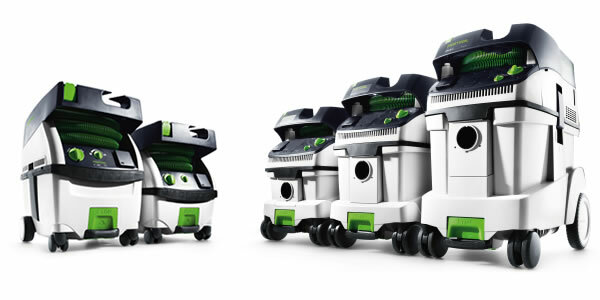 FESTOOL recently announced that they have made some improvements to the CT MINI and MIDI models of their dust extractor family. The new units will come standard with a HEPA filter factory installed and the new self-cleaning filter bags that were introduced last year in the CT 26 and CT 36. The best part: the price remains unchanged! This time last year, FESTOOL announced the introduction of the new CT 26 and CT 36 Dust Extractors. New for October 2011 is the CT 48 Dust Extractor, the largest Dust Extractor in the CT family. All of the new CT models feature HEPA filtration, variable suction control, tool-triggered operation, SysDock tool storage capabilities, an antistatic hose and many other features that you’ve come to expect from FESTOOL’s industry leading dust extractors. For a complete list of features, visit their website. For industrial and commercial dust extraction, I’d recommend ESL. Dust is efficiently minimised, staff are far happier and prodcutivity has improved! Hopefully this will be helpful to our readers in the United Kingdom… a little out of our service area. Thanks for sharing!